Imagine that you could travel back in time four and a half billion years ago, when the solar system was still just a bunch of rocks and dust and gas mixing together. Imagine watching all those billions of years of history re-created in front of you. Now, imagine that scientists are working to reconstruct this history with objects found here on Earth. One of the scientists is Tom Zega, an assistant professor in the University of Arizona’s Lunar and Planetary Laboratory. 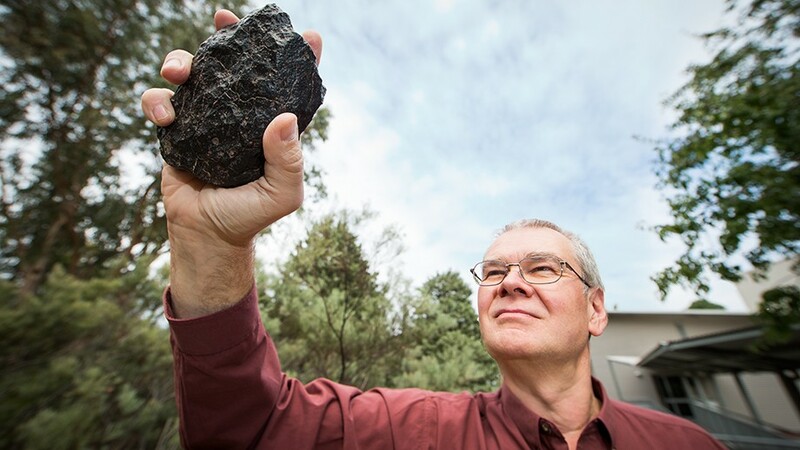 He studies “presolar grains,” which are the remains of ancient stars preserved in meteorites. These grains contain clues for scientists looking to build a narrative about the nearby stars before the birth of the solar system. Considering the scale of the undertaking, it is surprising that the evidence found in these presolar grains is microscopic. Scientists find the grains in chunks of meteorite mostly made up of rocks that formed after the solar system’s creation. “Those of us that are interested in understanding stardust basically have to find needles in the haystack,” Zega says. The best samples of presolar grains come from meteorites found soon after their fall to Earth, so that any grains inside are not affected by rain or heat. To help find the needles, scientists employ some clever techniques. “We’ll take a chunk of a meteorite, we’ll boil it up in these harsh, nasty, aggressive acids, and then we’ll generate a residue,” Zega says. The process eliminates some of the excess meteorite and increases the chances of finding a presolar grain. The grains have endured millions of years of exposure to cosmic rays and maintained their original form, so some will withstand the acid and remain in the residue. Grains are only a few hundred nanometers wide. For context, a strand of human hair is 100,000 nanometers wide, and one nanometer is about half the width of a strand of DNA. To image the grains, scientists must use microscopes powerful enough to look at individual atoms. Through this procedure, Zega and a team of researchers discovered the first grain of magnetite with confirmed presolar origins and published their results in the Astrophysical Journal. From a sample only 650 nanometers wide, Zega estimated the size and chemical composition of its parent star, a star that inhabited this part of the galaxy before the solar system came into existence. Even the discovery of this grain was revealing. The chemical reaction that created the magnetite almost certainly required water vapor. This is one of the first experimental confirmations of water vapor around an ancient star. With the right approach, Zega says he believes presolar grains could even help construct a timeline for the history of our local part of the galaxy. “We know the galaxy itself is about 13 billion years old, and we know the solar system is four and a half billion years old, but there’s a lot of billions of years in between there for things to happen,” he says. If we could age-date these grains the way we age-date rocks on Earth, then we could start to document the astrophysical events that took place in this period. That’s one way studies of presolar grains can go beyond traditional observations through telescopes. With meteorites, researchers can do more than observe stardust — they can actually hold it in their hands. 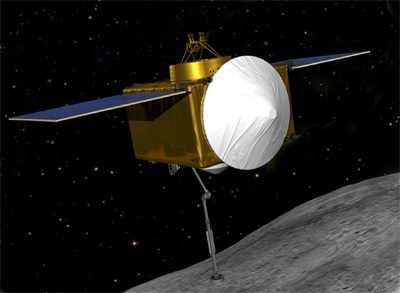 This excitement and curiosity inspires missions such as OSIRIS-REx, which aims to bring back samples of an asteroid for further study on Earth. For Zega and people in his field, that mission is like a dream come true. For the next step in his research, Zega would like to collect more samples of presolar grains and look at the trends among them. That could help answer some of the big questions in planetary science about the origin of the solar system. In particular, the grains offer an estimate for how many stars injected their matter into the early solar system — and what kind of stars they were. 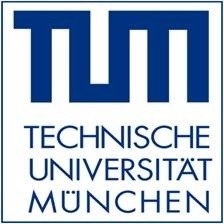 Geologists have discovered hidden magnetic messages from the early solar system in meteorites measured using the PEEM-Beamline at the BESSY II synchrotron located in The Helmholtz-Zentrum Berlin für Materialien und Energie (HZB). The information captures the dying moments of the magnetic field during core solidification on a meteorite parent body, providing a sneak preview of the fate of Earth’s own magnetic field as its core continues to freeze. Meteorites were previously thought to have poor magnetic memories, with the magnetic signals they carry having been written and rewritten many times during their long journey to Earth. [Dr. Richard] Harrison, however, identified specific regions filled with nanoparticles that were magnetically extremely stable. These “tiny space magnets” retain a faithful record of the magnetic fields generated by the meteorite’s parent body. Harrison and his colleagues could map these tiny magnetic signals using circular polarized X-ray synchrotron radiation at BESSY II. The Pallasite meteorite, studied by Harrison, contains information about the early solar system. Image copyright Natural History Museum, London. Sample used from the Natural History Museum Meteorite Collection. Meteorites have witnessed a long and violent history; they are fragments of asteroids which formed in the early solar system, 4.5 billion years ago. Shortly after their formation, some asteroids were heated up by radioactive decay, causing them to melt and segregate into a liquid metal core surrounded by a solid rocky mantle. Convection of the liquid metal created magnetic fields, just as the liquid outer core of the Earth generates a magnetic field today. From time to time asteroids crash together and tiny fragments fall to Earth as meteorites, giving scientists the opportunity to study the properties of the magnetic fields that were generated billions of years ago. “They are like natural hard discs”, Dr. Richard Harrison believes. The geologist from the Department of Earth Sciences, University of Cambridge, UK, is searching for methods to decipher the information stored deep inside the space rocks. Now his new approach has yielded its first results. Until now it was not clear whether ancient magnetic signals could be retained by stony-iron meteorites at all. Large and highly mobile magnetic domains are found within the iron metal: these domains create huge magnetic signals but are easily overwritten by new events. The probability that these regions might contain useful information about early magnetic fields in the solar system is extremely low. But Harrison took a much closer look. At the PEEM-Beamline of BESSY II, Harrison and PhD student James Bryson found dramatic variation in magnetic properties as they went through the meteorite. They saw not only regions containing large, mobile magnetic domains, but also identified an unusual region called the cloudy zone containing thousands of tiny particles of tetrataenite, a super hard magnetic material. “These tiny particles, just 50 to 100 nanometers in diameter, hold on to their magnetic signal and don’t change. So it is only these very small regions of chaotic looking magnetization that contain the information we want”, Bryson concludes. The PEEM-Beamline offers X-rays with the specific energy and polarization needed to make sense of these magnetic signals. Since the absorption of the X-rays depends on the magnetization, the scientists could map the magnetic signals on the sample surface in ultrahigh resolution without changing them by the procedure. “The new technique we have developed is a way of analyzing these images to extract real information. So we can do for the first time paleomagnetic measurements of very small regions of these rocks, regions which are less than one micrometer in size. These are the highest resolution paleomagnetic measurements ever made”, Harrison points out. By spatially resolving the variations in magnetic signal across the cloudy zone, the team were able to reconstruct the history of magnetic activity on the meteorite parent body, and were even able to capture the moment when the core finished solidifying and the magnetic field shut down. These new measurements answer many open questions regarding the longevity and stability of magnetic activity on small bodies. Their observations, supported by computer simulations, demonstrate that the magnetic field was created by compositional, rather than thermal, convection – a result that changes our perspective on the way magnetic fields were generated during the early solar system and even provides a sneak preview of the fate of Earth’s own magnetic field as its core continues to freeze. An ancient meteorite and high-energy X-rays have helped scientists conclude a half century of effort to find, identify and characterize a mineral that makes up 38 percent of the Earth. And in doing so, a team of scientists led by Oliver Tschauner, a mineralogist at the University of Las Vegas, clarified the definition of the Earth’s most abundant mineral – a high-density form of magnesium iron silicate, now called Bridgmanite – and defined estimated constraint ranges for its formation. Their research was performed at the Advanced Photon Source, a U.S. Department of Energy (DOE) Office of Science User Facility located at DOE’s Argonne National Laboratory. 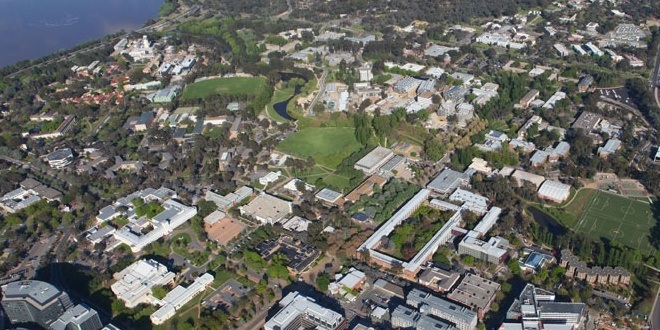 The mineral was named after 1946 Nobel laureate and pioneer of high-pressure research Percy [Williams] Bridgman. The naming does more than fix a vexing gap in scientific lingo; it also will aid our understanding of the deep Earth. To determine the makeup of the inner layers of the Earth, scientists need to test materials under extreme pressure and temperatures. For decades, scientists have believed a dense perovskite structure makes up 38 percent of the Earth’s volume, and that the chemical and physical properties of Bridgmanite have a large influence on how elements and heat flow through the Earth’s mantle. But since the mineral failed to survive the trip to the surface, no one has been able to test and prove its existence – a requirement for getting a name by the International Mineralogical Association. Shock-compression that occurs in collisions of asteroid bodies in the solar system create the same hostile conditions of the deep Earth – roughly 2,100 degrees Celsius (3,800 degrees Farenheit) and pressures of about 240,000 times greater than sea-level air pressure. The shock occurs fast enough to inhibit the Bridgmanite breakdown that takes place when it comes under lower pressure, such as the Earth’s surface. 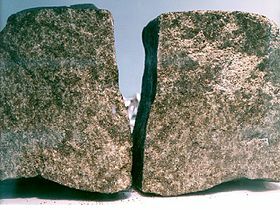 Part of the debris from these collisions falls on Earth as meteorites, with the Bridgmanite “frozen” within a shock-melt vein. Previous tests on meteorites using transmission electron microscopy caused radiation damage to the samples and incomplete results. So the team decided to try a new tactic: non-destructive micro-focused X-rays for diffraction analysis and novel fast-readout area-detector techniques. Tschauner and his colleagues from Caltech and the GeoSoilEnviroCARS, a University of Chicago-operated X-ray beamline at the APS at Argonne National Laboratory, took advantage of the X-rays’ high energy, which gives them the ability to penetrate the meteorite, and their intense brilliance, which leaves little of the radiation behind to cause damage. The team examined a section of the highly shocked L-chondrite meteorite Tenham, which crashed in Australia in 1879. 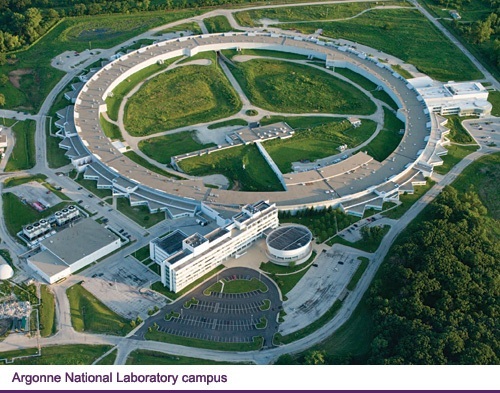 The GSECARS beamline was optimal for the study because it is one of the nation’s leading locations for conducting high-pressure research. Bridgmanite grains are rare in the Tenhma meteorite, and they are smaller than 1 micrometer in diameter. Thus the team had to use a strongly focused beam and conduct highly spatially resolved diffraction mapping until an aggregate of Bridgmanite was identified and characterized by structural and compositional analysis. This first natural specimen of Bridgmanite came with some surprises: It contains an unexpectedly high amount of ferric iron, beyond that of synthetic samples. Natural Bridgmanite also contains much more sodium than most synthetic samples. Thus the crystal chemistry of natural Bridgmanite provides novel crystal chemical insights. This natural sample of Bridgmanite may serve as a complement to experimental studies of deep mantle rocks in the future. Prior to this study, knowledge about Bridgmanite’s properties has only been based on synthetic samples because it only remains stable below 660 kilometers (410 miles) depth at pressures of above 230 kbar (23 GPa). When it is brought out of the inner Earth, the lower pressures transform it back into less dense minerals. Some scientists believe that some inclusions on diamonds are the marks left by Bridgmanite that changed as the diamonds were unearthed. The team’s results were published in the November 28 issue of the journal Science as Discovery of bridgmanite, the most abundant mineral in Earth, in a shocked meteorite, by O. Tschauner at University of Nevada in Las Vegas, N.V.; C. Ma; J.R. Beckett; G.R. Rossman at California Institute of Technology in Pasadena, Calif.; C. Prescher; V.B. Prakapenka at University of Chicago in Chicago, IL. This research was funded by the U.S. Department of Energy, NASA, and NSF. ESA and national disaster response offices recently rehearsed how to react if a threatening space rock is ever discovered to be on a collision course with Earth. Last month, experts from ESA’s Space Situational Awareness (SSA) programme and Europe’s national disaster response organisations met for a two-day exercise on what to do if an asteroid is ever found to be heading our way. 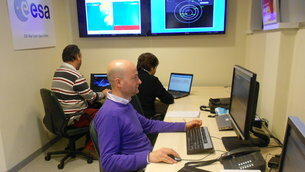 In ESA’s first-ever asteroid impact exercise, they went through a countdown to an impact, practising steps to be taken if near-Earth objects, or NEOs, of various sizes were detected. 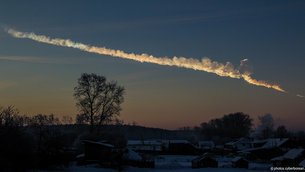 The exercise considered the threat from an imaginary, but plausible, asteroid, initially thought to range in size from 12 m to 38 m – spanning roughly the range between the 2013 Chelyabinsk airburst and the 1908 Tunguska event – and travelling at 12.5 km/s. Teams were challenged to decide what should happen at five critical points in time, focused on 30, 26, 5 and 3 days before and 1 hour after impact. “There are a large number of variables to consider in predicting the effects and damage from any asteroid impact, making simulations such as these very complex,” says Detlef Koschny, head of NEO activities in the SSA office. “These include the size, mass, speed, composition and impact angle. Nonetheless, this shouldn’t stop Europe from developing a comprehensive set of measures that could be taken by national civil authorities, which can be general enough to accommodate a range of possible effects. ESA’s Optical Ground Station (OGS) is 2400 m above sea level on the volcanic island of Tenerife. They studied questions such as: how should Europe react, who would need to know, which information would need to be distributed, and to whom? “For example, within about three days before a predicted impact, we’d likely have relatively good estimates of the mass, size, composition and impact location,” says Gerhard Drolshagen of ESA’s NEO team. 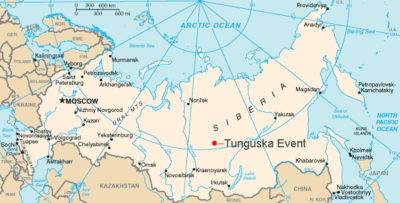 During the 2013 Chelyabinsk event, for instance, the asteroid, with a mass of about 12 000 tonnes and a size of 19 m, hit the upper atmosphere at a shallow angle and a speed of about 18.6 km/s, exploding with the energy of 480 kilotons of TNT at an altitude of 25–30 km. 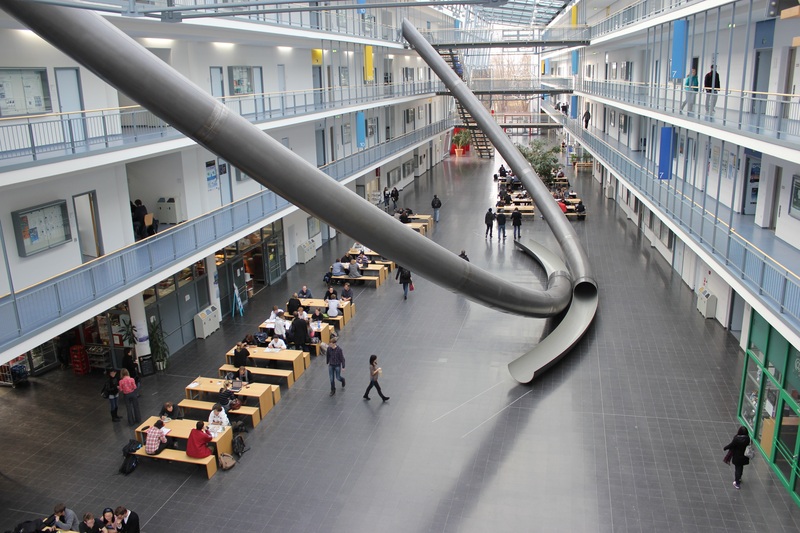 While potentially a real hazard, no injuries due to falling fragments were reported. Instead, more than 1500 people were injured and 7300 buildings damaged by the intense overpressure generated by the shockwave at Earth’s surface. Many people were injured by shards of flying glass as they peered out of windows to see what was happening. “In such a case, an appropriate warning by civil authorities would include simply telling people to stay away from windows, and remain within the strongest portions of a building, such as the cellar, similar to standard practice during tornados in the USA,” says Gerhard. In a real strike, ESA’s role would be crucial. It will have to warn both civil protection authorities and decision-makers about the impact location and time. It would also have to share reliable scientific data, including possible impact effects, and provide trustworthy and authoritative information. The exercise ended on 25 November, a significant step forward at highlighting the unique factors in emergency planning for asteroid strikes, and possible courses of action. It also clarified a number of open points, including requirements from civil protection agencies and the type and time sequence of information that can be provided by ESA’s SSA. It is another step in the continuing effort to set up an internationally coordinated procedure for information distribution and potential mitigation actions in case of an imminent threat. ESA’s NEO team is also working with international partners, agencies and organisations, including the UN, to help coordinate a global response to any future impact threat (see “Getting ready for asteroids”). With the aim of strengthening ESA’s and Europe’s response, similar exercises will be held in the future. The next, in 2015, will include representatives from additional countries. A meteorite that crashed down in California’s gold country is showing off treasures of a different sort: small diamonds that could tell scientists more about the insides of asteroids. The Sutter’s Mill meteorite smashed into the ground on April 22, 2012, after a fiery entry that caught the attention of professional and amateur observers alike. A scientific team raced against rain to pick up meteorite fragments before water polluted the samples. Their efforts helped to produce a cosmic jackpot. NASA Ames and SETI Institute meteor astronomer Peter Jenniskens collected fragments of the Sutter’s Mill meteorite fall on April 24, 2012, two days following the fall, the second recovered find. 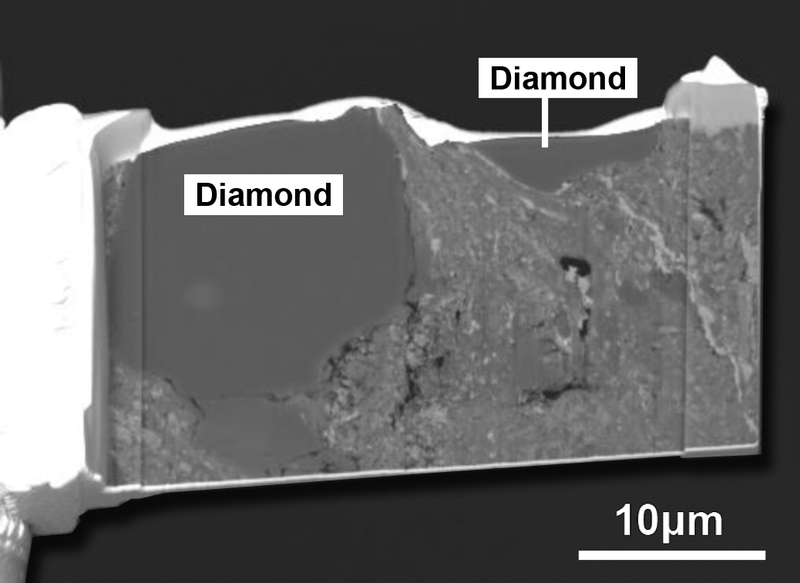 Embedded in part of the meteorite were 10-micron diamond grains — much smaller than what is used in diamond rings. But their diminutive size is still bigger than what is usually found in meteorites. The finding hints at what could have existed in the parent cosmic body that eventually broke apart and produced the Sutter’s Mill meteoroid before the fragment slammed into Earth’s atmosphere. A composite image showing how the Sutter’s Mill meteorite fell in California in April 2012. Diamonds weren’t all that researchers found. More fragments revealed isotopes of an element called chromium. The different types of chromium reveal that at least five stars sent material to the young solar system about 4.5 billion years ago, with some of the materials still sticking around in the meteorite, scientists found. “The formation of the solar system did not fully erase and homogenize these signatures, and Sutter’s Mill provides the clearest record yet,” Qing-Zhu Yin, the Sutter’s Mill Meteorite Consortium lead in isotope and trace element geochemistry, said in the same statement. A secondary electron image revealing diamond crystals inside a fragment of a meteorite that fell in Sutter’s Mill, California. The small body had a complicated history after that, with liquid water permeating some fragments (producing minerals such as calcium and magnesium carbonate). This could have been an indication of radiation in the meteorite’s parent body, which heated ice beyond the melting point. Other unusual elements — such as a calcium sulfide called oldhamite — also indicate heating in the parent body, as well as in areas that were not heated at all. Heating also came when the fragment was sailing on its own. Sometime in the past 100,000 years, the meteoroid was heated up to at least 572 degrees Fahrenheit (300 degrees Celsius). This heating could have happened during the entry into Earth’s atmosphere, the researchers said. “I don’t know of any similar meteorites that contain both heated and unheated materials,” said team member Mike Zolensky, a space scientist at NASA’s Johnson Space Center in Houston. The heated portions caused other changes inside the meteorite’s interior, such as the removal of volatile organic compounds. Scientists also managed to track down amino acids (protein building blocks) inside the meteorite. Thirteen papers based on the findings were recently published in the journal Meteoritics and Planetary Science. A rock from space is giving scientists the first glimpse of a mineral long thought to be the most abundant mineral on Earth, but which researchers lacked a natural sample of until now. This discovery could shed light on the structure and dynamics of the inner Earth, as well as the early history of the solar system, according to the new paper. “The search for this mineral in meteorites has been going on for decades — it was just a matter of finding the right method for detecting it,” said lead study author Oliver Tschauner, a mineralogist at the University of Nevada, Las Vegas. The mineral is a high-density version of magnesium iron silicate. It is the most abundant mineral on Earth, and makes up about 38 percent of the planet’s volume. But it’s only stable at very high pressures and temperatures, so for decades, researchers had only seen lab-generated versions of it. Under the heat and pressure found in Earth’s lower mantle, which extends from about 410 to 1,615 miles (660 to 2,600 kilometers) below the planet’s surface, magnesium silicate can form what is called a perovskite structure, which can be imagined as an array of double pyramids that are joined at their corners. The centers of each pyramid are made of silicon, the apexes and corners are made of oxygen, and magnesium and iron reside in the spaces between each double pyramid. But scientists had not discovered a naturally occurring version of this mineral until now — the mineral would not survive the long journey from the lower mantle to Earth’s surface because it would readily transform into lower-density minerals. The fact that scientists had not found any specimens of magnesium iron silicate perovskite in nature also meant it could not get an official mineral name from the International Mineralogical Association. This presented geologists with the odd situation of a nameless mineral being the most abundant one on Earth. Since researchers could not find a naturally occurring version of magnesium iron silicate perovskite from Earth, they instead looked to space. They hypothesized that high-speed cosmic impacts could generate the pressures and temperatures needed to create this mineral, and samples of it could then come to Earth as meteorites knocked off their parent asteroids or planets. Recently, Tschauner and his colleagues carefully isolated magnesium iron silicate perovskite in a meteorite. The mineral was given has the official name of “bridgmanite,” after the father of high-pressure experiments, Nobel laureate Percy Bridgman, according to the report, published in the Nov. 28 issue of the journal Science. The researchers analyzed a Tenham meteorite, a rock that was part of a meteor shower that rained down on Australia on a spring night in 1879. 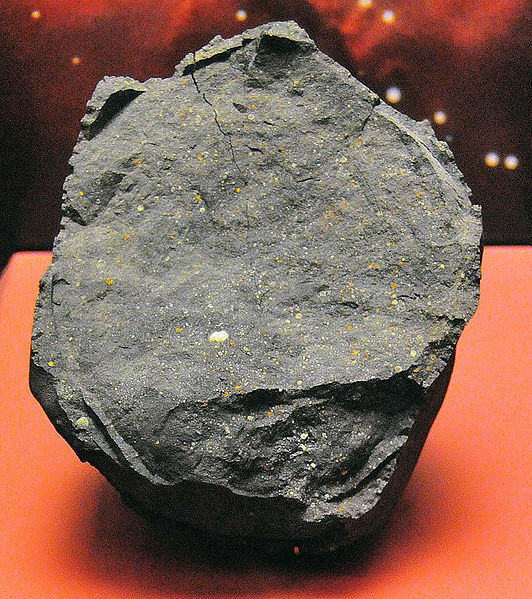 This meteorite bore signs that it was part of an asteroid that experienced a great impact. The stone also possessed minerals called akimotoite and ringwoodite, which are similar in composition and origin to bridgmanite. In prior attempts to find bridgmanite in meteorites, researchers often used electron microscopes. However, this strategy involves probing the rocks with electron beams that can turn bridgmanite to glass. Instead, Tschauner and his colleagues used high-energy X-rays from a synchrotron, a kind of particle accelerator. These intense X-rays do little damage to bridgmanite, thus helping the scientists prove its composition and crystal structure. The researchers found that bridgmanite was higher in iron and sodium than they had expected based on synthetic samples. “This gives interesting insights for what might be going on in the lower mantle,” Tschauner said. Tschauner added that detecting bridgmanite in other meteorites could shed light on the strength of the impacts their parent bodies experienced. The pressures and durations of these impacts in turn “allow us to estimate the size of the parent bodies of these meteorites, and with enough data, we can, for given points in time in the solar system’s history, figure out how large bodies in the solar system were,” Tschauner said. Now, a team of researchers has replicated these experiments on a meteorite found on Earth, and found that it produced chloromethane from organic materials contained in the space rock. The findings suggest the chloromethane on Mars may have come from meteorite debris on the planet’s surface or the Martian soil itself, rather than from Earth. NASA’s Viking landers descended onto the Red Planet in 1976. The Viking 1 lander, the first of the two, detected chloromethane in a sample of soil it baked in a small oven on board. The second lander, Viking 2, did not detect chloromethane, but did find traces of dichloromethane, another organic compound. However, scientists dismissed the findings, saying they were contamination from Earth. More recently, NASA’s Curiosity rover found traces of chloromethane in soil heated in one of its own chemistry instruments. Again, researchers claimed the chemicals were nothing more than terrestrial contamination, partly because it wasn’t clear whether such chemicals could form on their own. Mars is constantly pummeled by small rocks called micrometeorites. “Every year, about 50,000 tons fall on the Martian surface,” Keppler said. Most of these are carbonaceous, meaning they contain carbon, an essential building block for life. The researchers heated up material from the Murchison meteorite to temperatures of up to 750 degrees Fahrenheit (400 Celsius), similar to those in the Viking and Curiosity experiments, and sure enough, they found chloromethane. They knew it wasn’t contamination from Earth because it had a different chemical fingerprint. Chemical elements come in different forms, called isotopes. The researchers looked at the isotope signatures of carbon and nitrogen in the chloromethane from the meteorite, and they didn’t match those found on Earth. Heating up the chemicals produced similar amounts of chloromethane as those found by Viking and Curiosity, suggesting the same process may have occurred with micrometeorites on the Red Planet.